Presented at the 244th National Meeting & Exposition of the American Chemical Society (ACS), scientists have shown that a new process for converting municipal waste, algae, corn stalks, and similar materials into gasoline, diesel, and jet fuel is showing the same promise it did in larger operations as it did in laboratory-scale devices. 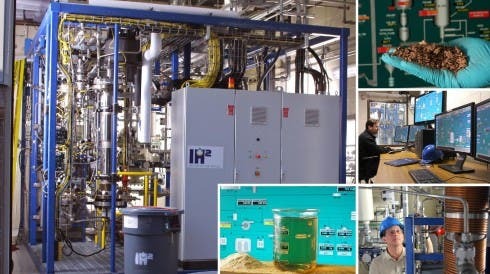 The new technology is termed Integrated Hydropyrolysis and Hydroconversion (IH2), and it involves the use of internally generated hydrogen and a series of proprietary catalysts which jump-start chemical reactions that otherwise would happen relatively slowly, or not at all. IH2 uses practically any kind of nonfood biomass material to produce gasoline, jet fuel, or diesel fuel. Anything from wood, cornstalks and cobs to algae, aquatic plants, and municipal waste. Lincksaid it differs from other biofuel technologies in producing a finished, ready-to-use liquid hydrocarbon fuel, rather than crude intermediate substances or substances that contain unwanted oxygen, which must be further processed and upgraded to meet specifications for transportation fuels. He cited other advantages of the IH2 technology, including flexibility to use a broad range of feedstocks and mixtures of feedstocks from different sources; the use of existing technology and equipment, which keeps its cost low; and production of 90 percent less greenhouse gas per gallon than fossil fuels. CO2 is the major greenhouse gas in this case. The process does not require external hydrogen gas since it produces its own directly from the biomass feed ― a key advantage because most hydrogen gas today is made from natural gas or coal. IH2‘s developer, the Gas Technology Institute (GTI), is already operating two pilot plants that will test and refine the process. Both operations are using wood, corn stalks, and leaves or algae as biomass material. The smaller of the two plants has a capacity of just one pound of biomass per hour, and can produce anywhere between 72 and 157 gallons of fuel per ton of dry, ash-free feedstock. The second plant, larger, can handle more than a hundred pounds of biomass per hour, and is designed to operate continuously.